While the Royal Huisman yard has undertaken refit work for many years, it has now completed an in-depth study pointing to even more efficient deployment of its human and physical resources over a wider range and a greater number of projects. 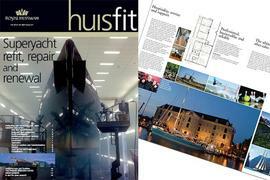 “It is well known that Royal Huisman houses a large concentration of expertise, infrastructure and specialist skills,” commented Managing Director Alice Huisman, “and for customers seeking not just a standard refit but the optimum level of quality, enhancement and added value, the yard has a great deal to offer. An unusual element of this new “huisfit” proposition is that the work can be undertaken either at the Vollenhove yard or at deep water locations elsewhere in Holland to suit the owner’s or captain’s preference and requirements of the project. The very comprehensive range of refit services is designed to be tailored to the exact requirements of each individual project, whether modern or classic, sail or motor, from all quality yards. Following a major investment programme in amenities and services in recent years, Royal Huisman’s facilities for project managers and crew on-site are seen to be at the leading edge of industry practice. And when the project is concluded, owners and captains have the peace of mind of knowing that the work is fully supported by Royal Huisman’s fully manned 24/7 parts and technical advice service. Furthermore the yard will always stand fully behind the quality of its refit work – just as it does for new builds.